Consider carefully where you want large garden planters to go before you move them into place. If it's practical, move heavy containers into place before you plant in them because they will be lighter without the added weight of soil and plant materials. If you have to move large pots later on, here are a few tips to keep in mind. For relocating large pots, tubs, and some barrels, you can buy our pot caddies that have wheels and can hold up to hundreds of pounds of weight. These are ideal for many planters, but you need to be sure they can hold the weight once the pottery is watered. And if you can plan ahead, hold off on watering to lighten the load when moving. To move a large, heavy container like concrete or stone pots, try using an old piece of carpeting or throw rug. With a helper, tip the container and slide the end of a long carpet strip underneath. Slide the container so that it rests completely on the carpet; then you can tug it along as your assistant steadies it. Cardboard, blankets and large sacks can also work this way. Sometimes an ordinary hand truck for furniture dolly can be useful. 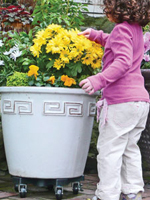 Take care to move long plant stems away from the sides as you balance the container on the foot of the dolly. A hand truck can work for long rectangular containers as long as you can balance them. Lastly, if you have to go up or down stairs, use a pair of long wooden planks to form a ramp and tie the container to a rope. 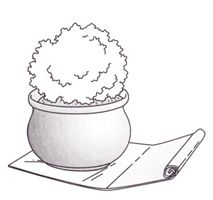 With a helper, pull up or gently lower the container slowly and securely. Err on the side of safety! Read more.....Top 10 remedies for the container blues!